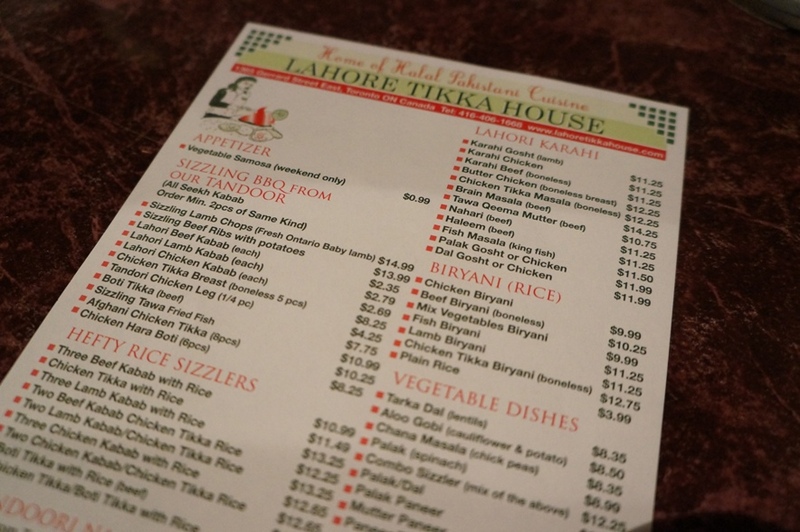 Eating at Lahore Tikka House is quite the experience, to say the least. Located on Gerrard east, in the heart of little India, the restaurant is situated in a building that can’t be missed. It’s a large palace-like building with strings of lights draped around the exterior. Walking into the restaurant, you might find yourself in the middle of pure chaos. My friends and I dropped by on a Friday evening and the space was packed. 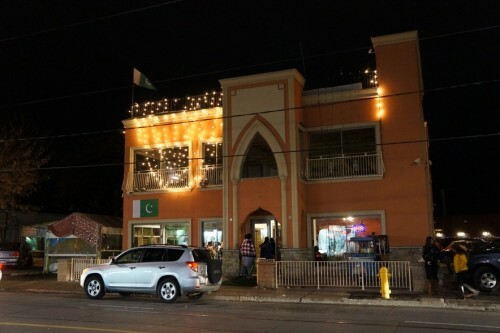 Lahore Tikka House is incredibly low key so keep this in mind before getting dressed. And when I say low-key, I mean low-key. 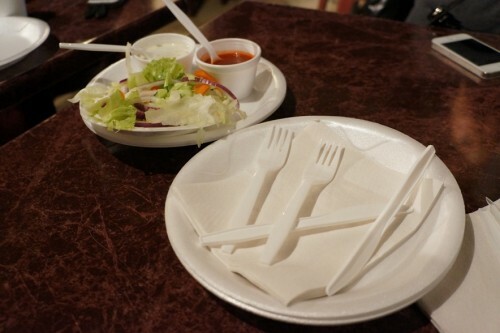 As in plastic lawn chairs and tables, styrofoam plates and plastic utensils. 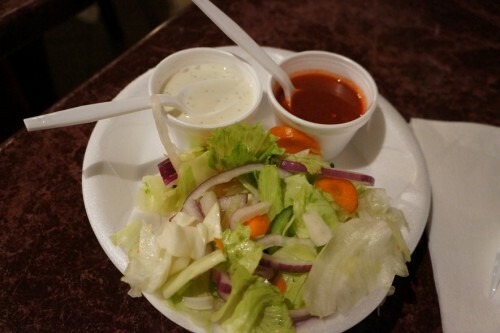 After being seated, they’ll bring you a plate of complimentary salad. It looked decent but I wanted to save room for all the food that was coming our way. In terms of ordering, they provide you with a paper menu. After you’ve decided what you want, you order your food up front. They bring the food to you and when you’re finished, you pay up at the cash register. The menu is broken into several sections – sizzling BBQ from the tandoor (kebabs, ribs, etc), hefty rice sizzlers, tandoori naans, Lahori Karahi, biryani, vegetable dishes and wraps. 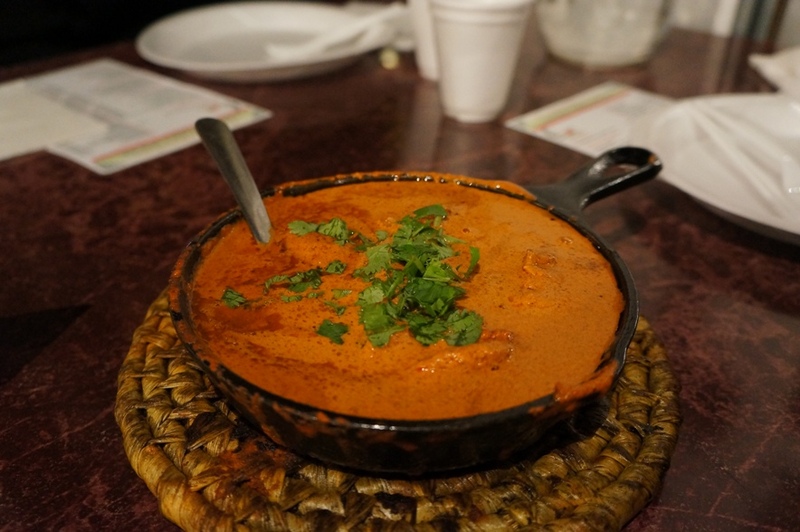 The first dish that arrived was the Butter Chicken – with boneless breast ($12.25). At first, I didn’t even realize it was butter chicken since it was unlike the thick, creamy butter chicken I’ve been accustomed to. Served piping hot in a skillet, it was thinner in consistency and had a thin layer of oil on top. Even though it didn’t taste like the butter chicken I usually love, I absolutely loved the one at Lahore Tikka. My only complaint was that it didn’t come with very much meat (which, by the way, was quite moist for breast meat). 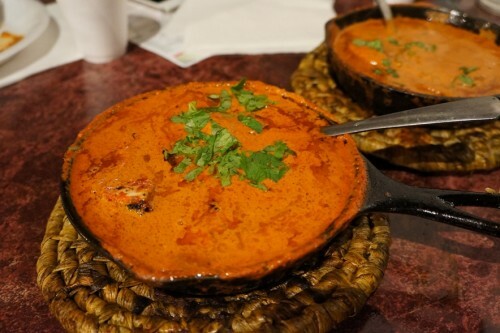 Next up was the Chicken Tikka Masala ($12.25). 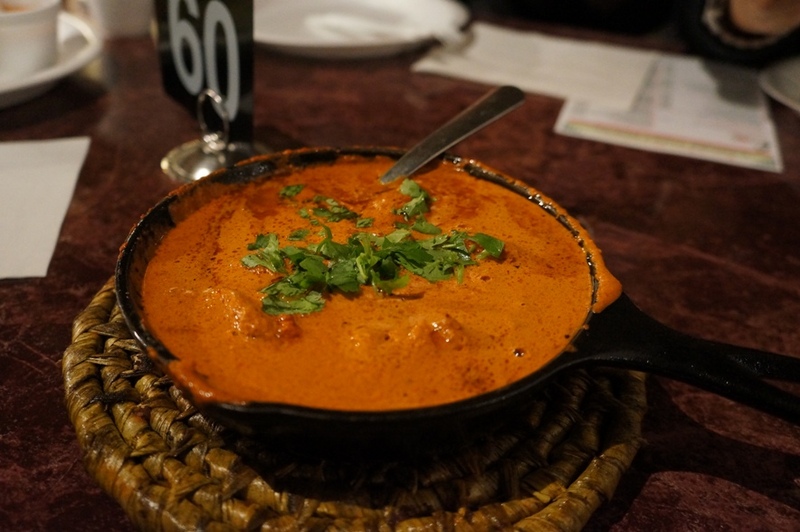 If we had known this was going to be so similar to the butter chicken we would’ve ordered something else. When our servers brought over the dishes, he told us that the butter chicken and the chicken tikka masala were basically the same dish except that the butter chicken had a little more cream in it. Since it tasted like the butter chicken, I enjoyed it but I would’ve preferred trying another dish instead. For some carbs, we ordered the Lamb Biryani ($11.25) aka Indian fried rice. It came in a heaping mound of basmati rice on a sizzling hot platter. The rice had a nice balance of spices and although it was a little on the greasy side, it was pretty darn satisfying. 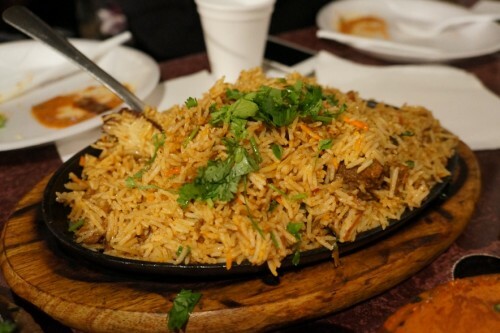 However, similar to the previous dishes we tried, I felt the biryani could’ve used a little bit more meat. After so many orders of kebabs passing by our table, we knew we had to give them a try. The Seekh kebabs come in three different varieties (beef, lamb and chicken) and require a minimum order of 2 kebabs of the same type. 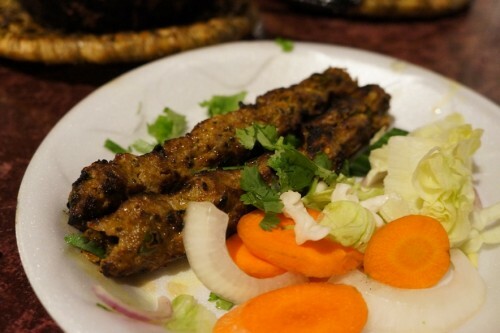 We decided to go with the Lahori Lamb Kebabs ($2.79 each). When I hear kebabs, I think of large chunks of meat pierced together with a skewer but the ones here aren’t your typical kebabs. Instead, they consist of long pieces of ground spiced meat. Pretty tasty! And surprisingly, the kebabs turned out to be the spiciest dish we tried. We needed some veg in our meal and ordered the Palak Paneer ($8.99). It certainly isn’t a pretty dish. Green, oily mush would be a good way to describe its appearance. 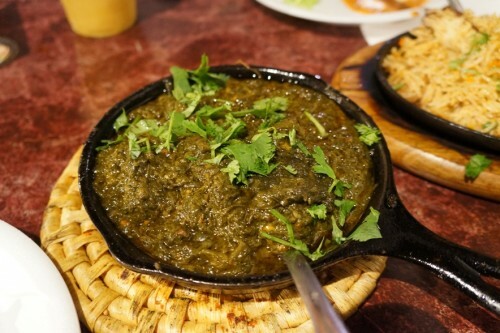 The dish is made from stewed spinach (which explains its appearance) and contains chunks of paneer cheese which has a dense texture similar to tofu. I’m not usually a huge fan of palak paneer in general so I can’t really comment on the dish but I’m happy to report everyone at the table loved it. I can’t have Indian food without naan and Lahore Tikka does it the best! They have a selection of tandoori naans – butter, till (sesame) and whole wheat roti. We ordered the Butter Naan ($1.99 each) and Garlic Naan ($2.25 each). They arrived at our table fresh out of the oven and were absolutely amazing. 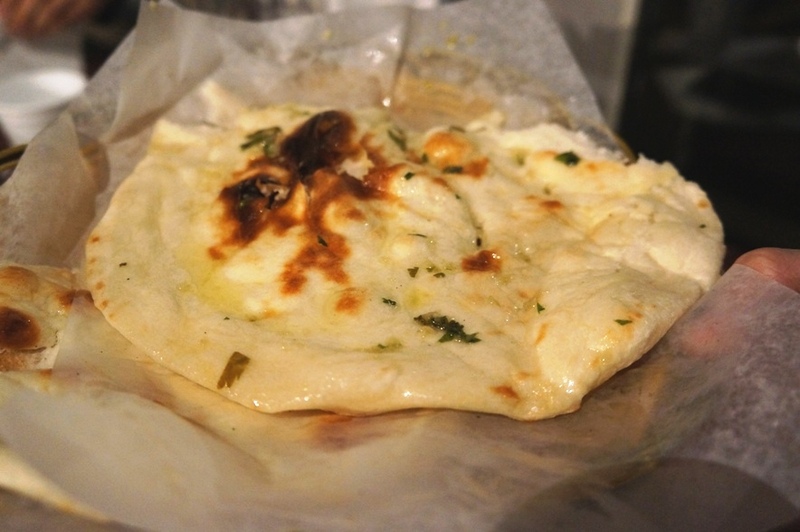 The garlic naan in particular – buttery and garlicky goodness! Sure, it’s a little chaotic in the restaurant but they serve up some damn good food that’ll satisfy your Indian food craving. I am Indian. And I would rate LTH as one of the better places to eat Indian/Pakistani cuisine. Most other places have disappointed me in TO – including the much hyped Kamasutra at Bayview and Lawrence. 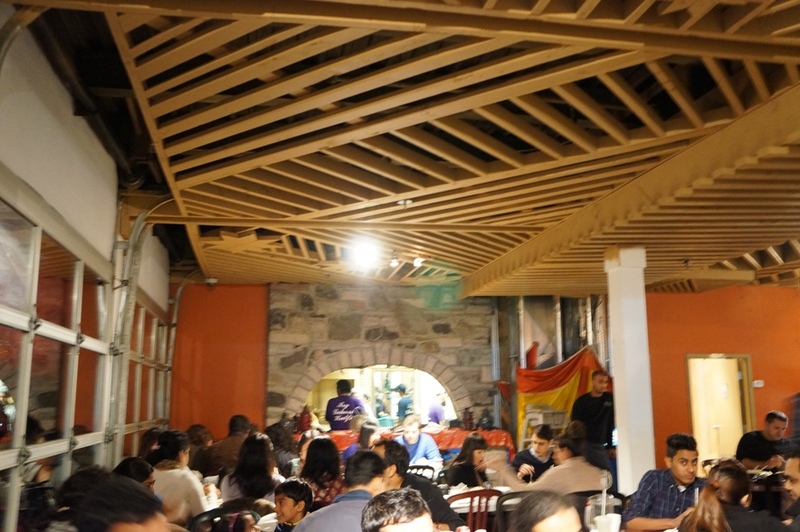 You should try the Lamb Chops @ Lahore Tikka House. They are pretty good. P.S. I dont like their butter chicken, its tad too oily for me.